This month’s featured artist, Veera Kaijanen, is an international touring performing artist who has spent past years with the top entertainment company, Cirque du Soleil. She specializes in hoola hoop dancing as her act as well as tight rope walking. 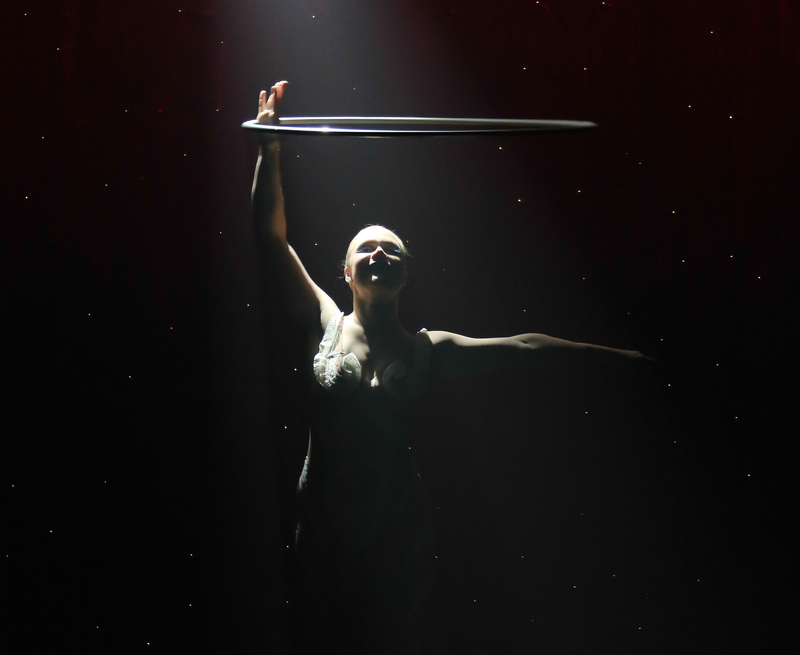 The goal of this project, Revontulet, was to create an instrumental track that evokes the emotion in her audience to match her performance on stage with her hoola hoops. Obviously, these projects don’t pop up every day! Challenge accepted. Step by step, our team layered a combination of keyboards, live drums, drum programming, electric bass, electric guitars and ambient layers of vocals to create the sound scape. The final product is something proud of, fit for the stage. *This live performance was at GOP variety theater in Hanover, Germany. The composer of Revontulet, is a favorite client of mine and also a touring performing artist, Kimmo Olavi. He recommended Veera to our team as we have helped him produce a few of his original pieces as well. Kimmo: Writing the song started from the movement of the hoola hoop. We talked with Veera that they look like the northern lights, and I sat on the piano and composed the track inspired by that visual image. Then I timed the melody together with Veera’s hoola hoop tricks, and we were ready to produce the track with Kati O Toole and the StudioPros production team. The process was again, amazing. It’s great to hear track by track how it molds. It’s like painting on canvas. You add layers and layers and layers, until the northern lights are there. Click here to read more about Kimmo and check his original compositions. How was the StudioPros process for you? Was it difficult to work online? Difficult? Not at all! I feel actually that it was very solid and easy way of working. Also, very quick. The work presented was always very professional. StudioPros was listening very well. My needs and result arrived in my email faster than I thought. Every single time. I really like this way of online working. It opens so many new doors for artists and makes things possible even from other side of the world. How did we help to get your songs sounding professional? With help of StudioPros’ fabulous musicians! Oh my what a fabulous work. Very defined and professional every single time, every single track. I liked the fact that we were able to try things out and do modifications throughout each step of the recording process. This song ‘Revontulet’ was actually my first production with StudioPros. Because of the great work me and my colleague Kimmo Olavi (who worked for and supported this project a lot) decided to mix straight away four different mixes from this song. All four for different occasions. Needless to say I will definitely come back, when I am in a need of a new song for my work. What was the inspiration and writing process like for Revontulet? For my song I had created the movement/hula hoop choreography. I was performing it with different music by that time for Cirque du Soleil. I knew I was going to need my own musical piece later on andI wanted to create something that really fits for me. I think we wanted to bring out my character in the piece. A girl from far north. To support my work and way of movement. Give it an edge, give it a kick. Also write something that audience could really enjoy and go with. Emotion is an important word for me. The song needed to be something very strong and fragile at the same time. Me and Kimmo Olavi used the northern lights as our inspiration. They are so solid, beautiful and still so strong at the same time. Also a little bit mystical. We can’t see them everyday. And they look like magic. Besides music, what else do you enjoy? I enjoy life in general! This specific moment I enjoy the possibility to be able to continue creating my dreams. I celebrate the fact that I am able to perform for living and go on stage on a daily basis. It’s something special. Tell us about your experience with touring and performing to music and the importance music plays in your every day life. For living I work as a circus performer. I’ve worked years with one of the world’s top entertainment companies, Cirque du Soleil. Currently I work as a freelancer. In the past 4 years I have been touring around the world and performing my acts in front of millions of people. Music plays a very important role for my work. It supports it, it gives the emotions and helps audience member watch and relate with the performance. I would not be the same without. The pieces I use have to be chosen very carefully. The right song in a right moment can work miracles. The wrong song can cause terrible misunderstandings and look terribly wrong. If you are interested in getting your songs produced professionally, don’t hesitate to contact producers Kati O’Toole or Robb Hutzal. If you’d like to discuss getting a project started, call: 1-310-928-7776. We look forward to working with you soon!